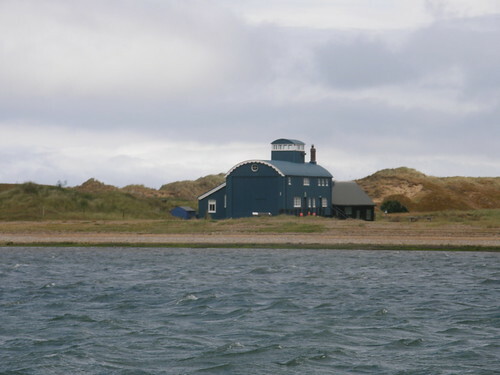 Sheep Island with Piel Island behind. 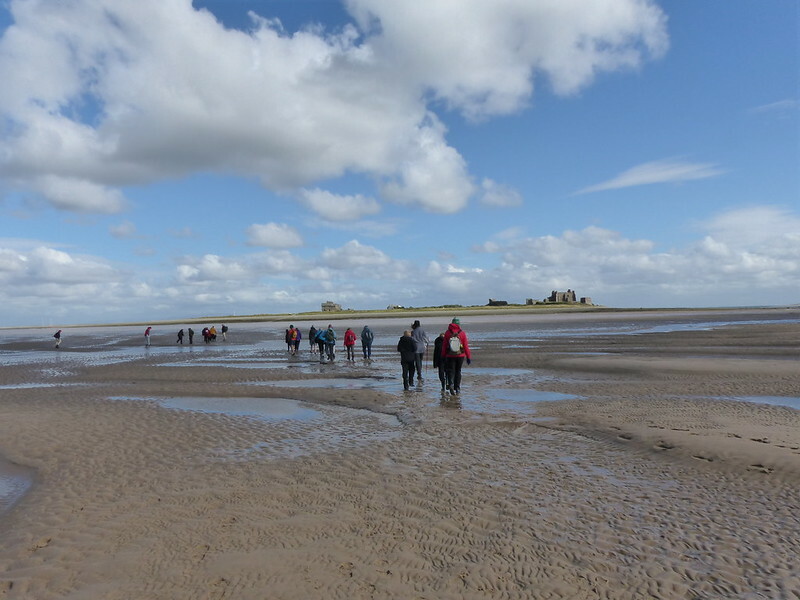 Onward and upward, to September and the 2015 Heritage Open Days. 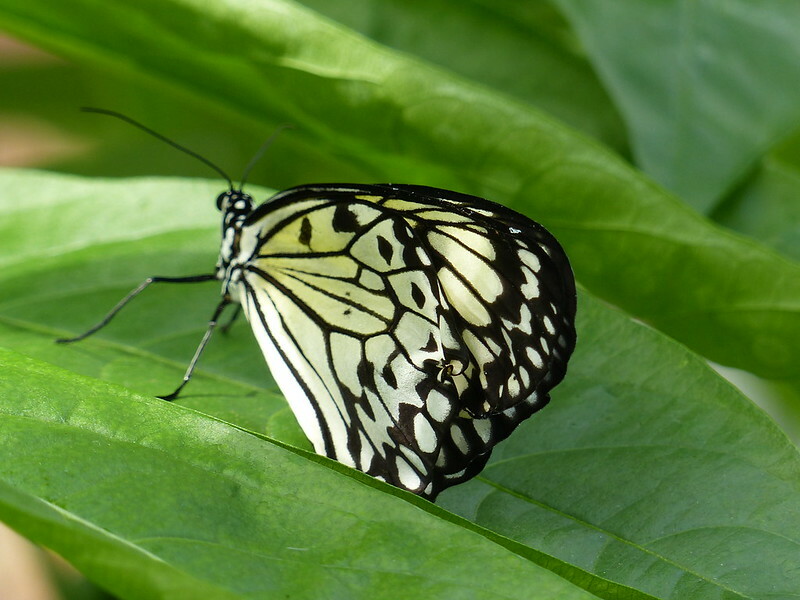 There are always lots of interesting events on that weekend across the UK; if you aren’t already aware of the event, then I would recommend that you get acquainted with what’s on offer in your area in 2016. 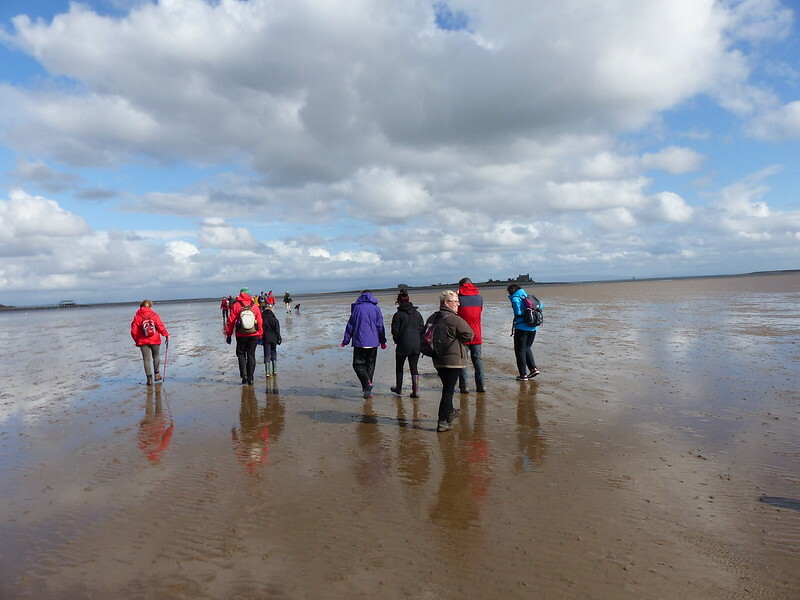 We chose to join a guided walk organised by the rather wonderful Morecambe Bay Partnership. 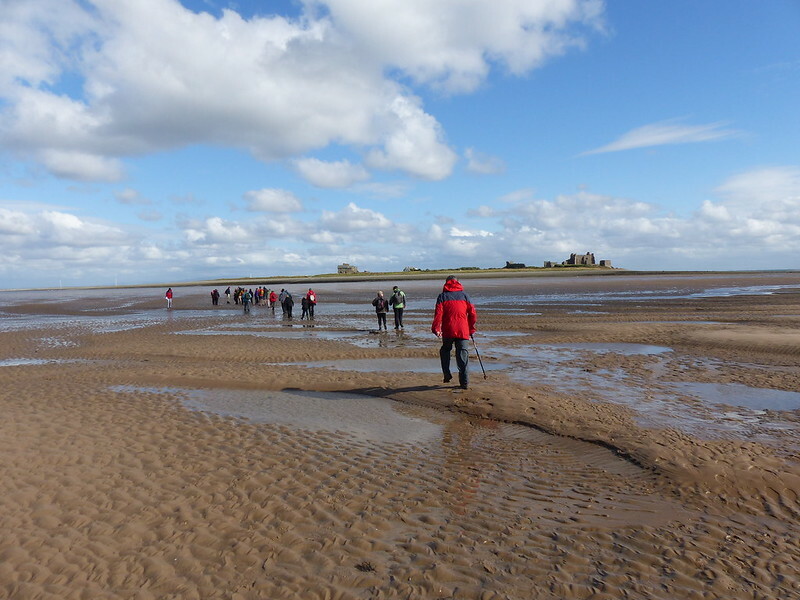 The event will include a guided walk across the sands from Walney Island to Piel Island, led by expert guide John Murphy who will be accompanied by eminent local archaeologist Rachel Newman. 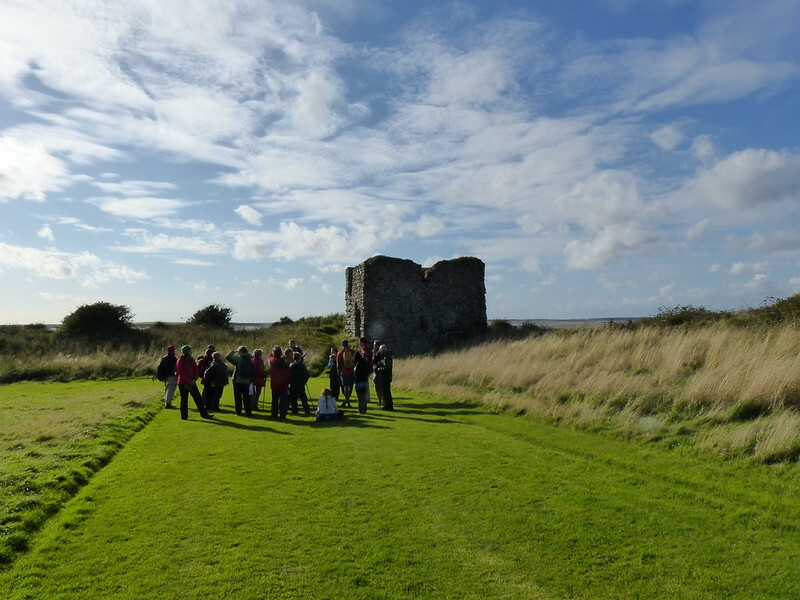 On Piel Island, Rachel Newman will provide an in-depth tour of the castle ruins, whilst informing visitors about the archaeological investigations undertaken during the 1980’s and hearing about challenges of excavating on a island. It was reassuring to have an expert guide on hand. 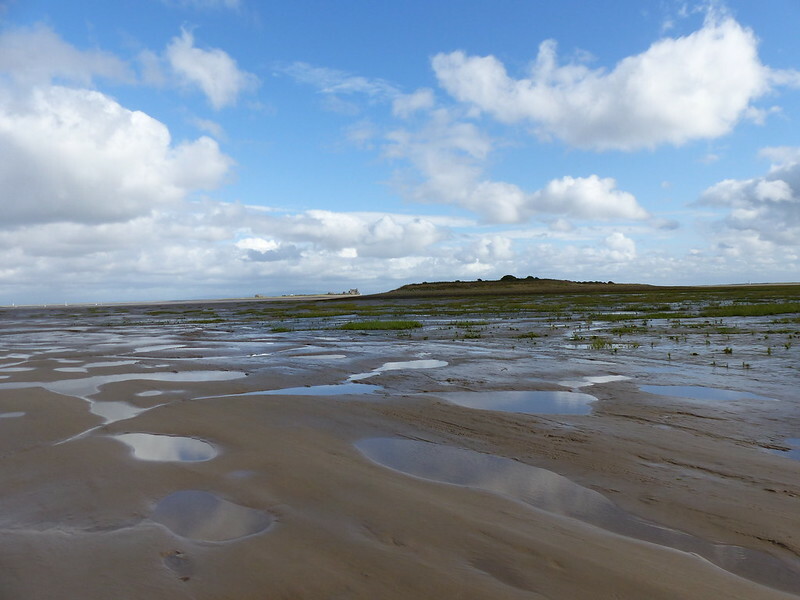 I’ve wandered a little on Morecambe Bay over the years, but I’ve never experienced anything quite like the area close to Piel Island, where the sands disconcertingly wobbled and squirmed like a jelly. 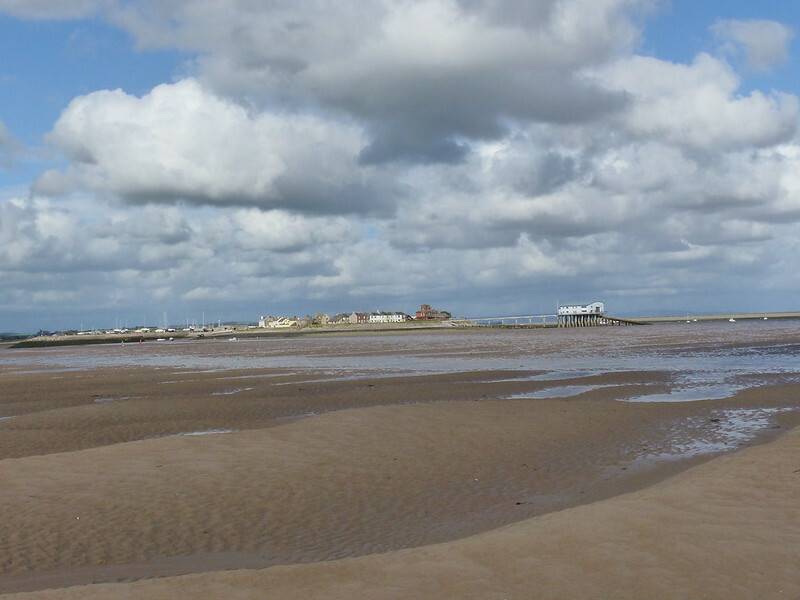 The beach was raised in long ridges and furrows, not dissimilar to the medieval field patterns which surrounded the village in which I grew up. 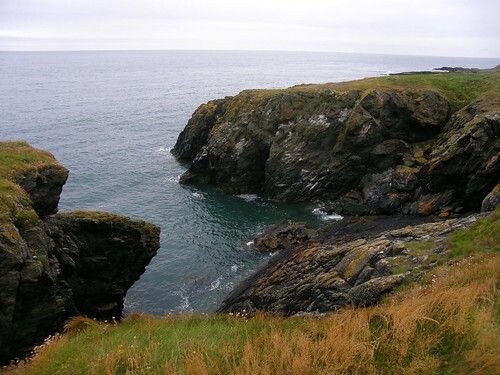 You might expect the tops of the ridges to be the driest and safest ground on which to walk, but on the contrary, they often seemed to be the most unstable and conspicuously colloidal: betwixt and between, neither sea nor strand but a treacherous hybrid of the two. 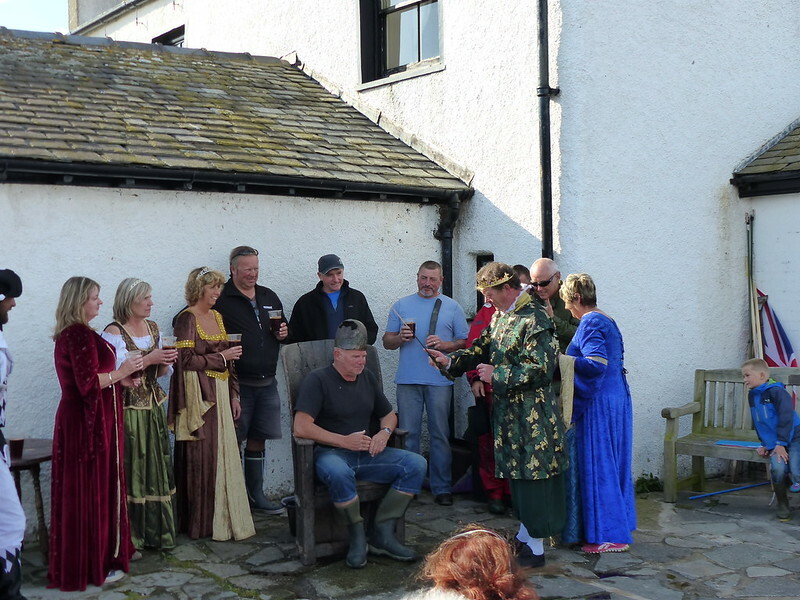 Once on Piel we were treated to an unexpected bonus: the landlord and landlady of ‘The Ship’ are traditionally King and Queen of the island, and today they were knighting two worthy subjects. 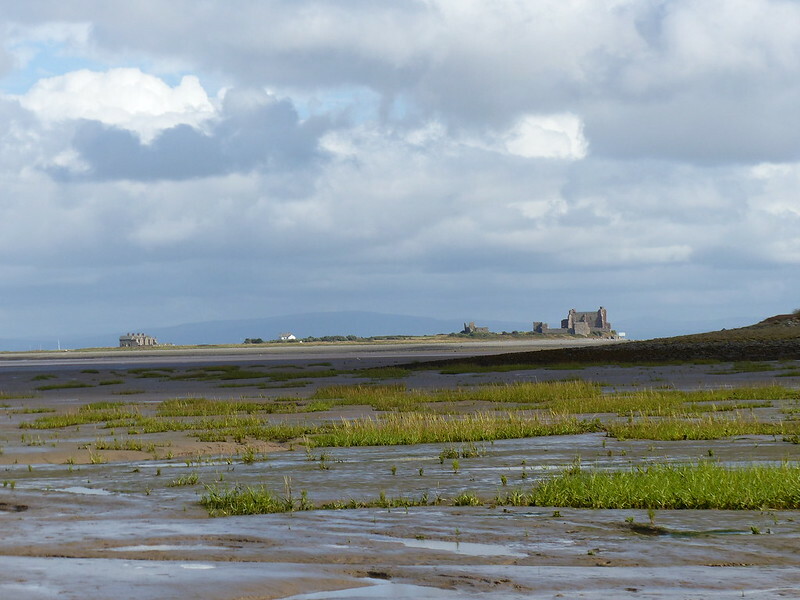 As we began our tour of Piel Castle, S and I were distracted by the seals visible, if somewhat distantly, on the beach at the southern tip of Walney Island. 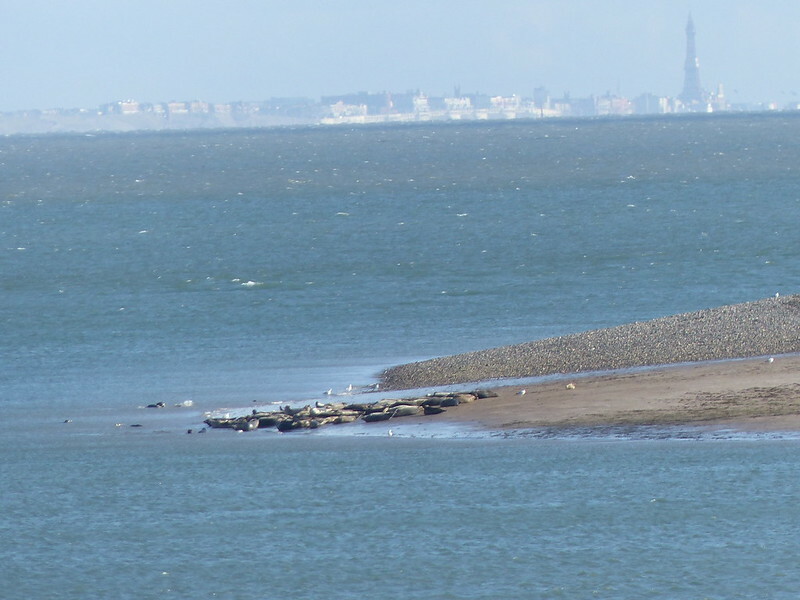 I tried to use the zoom on my camera to get S a clearer view of the seals, and was surprised by how clearly Blackpool Tower could be seen in the background. 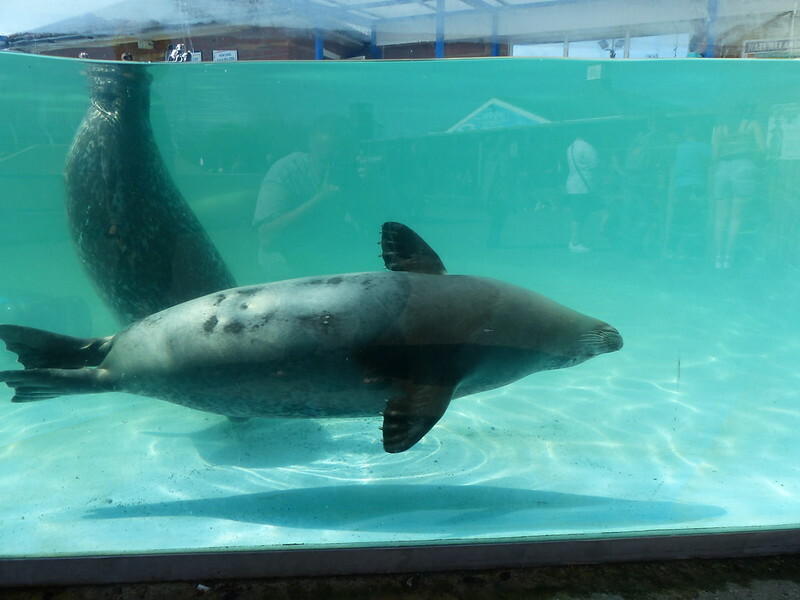 Since then, these seals have hit the news.. 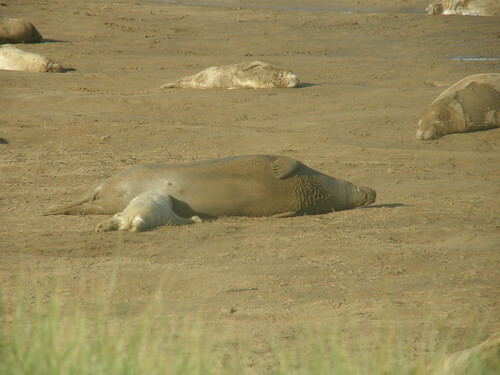 Seals have used the protected South Walney beaches to haul out and rest for decades. 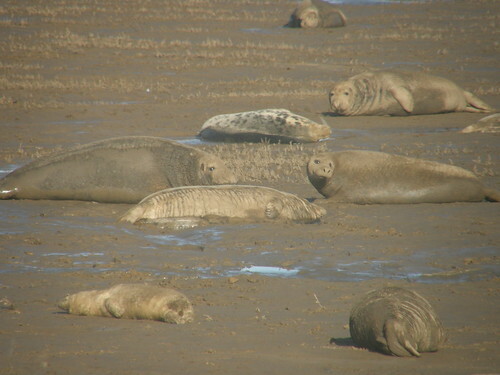 The colony found here are usually older bulls no longer able to control a harem on breeding beaches and sexually immature younger males and females. 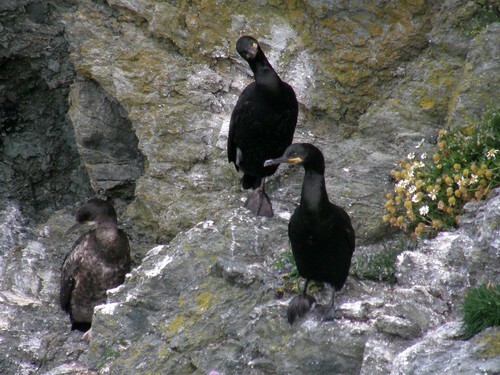 But now the reserve could be becoming a breeding colony. 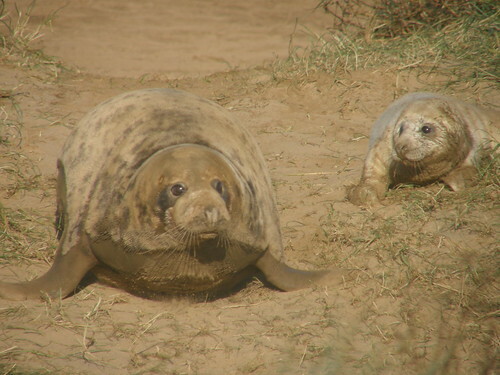 Pup one was born almost three weeks ago, then pup two was discovered on Sunday when it was believed to be a day old. I really enjoyed the guided tour, but it’s a while ago so I shan’t attempt to regurgitate any of the details. 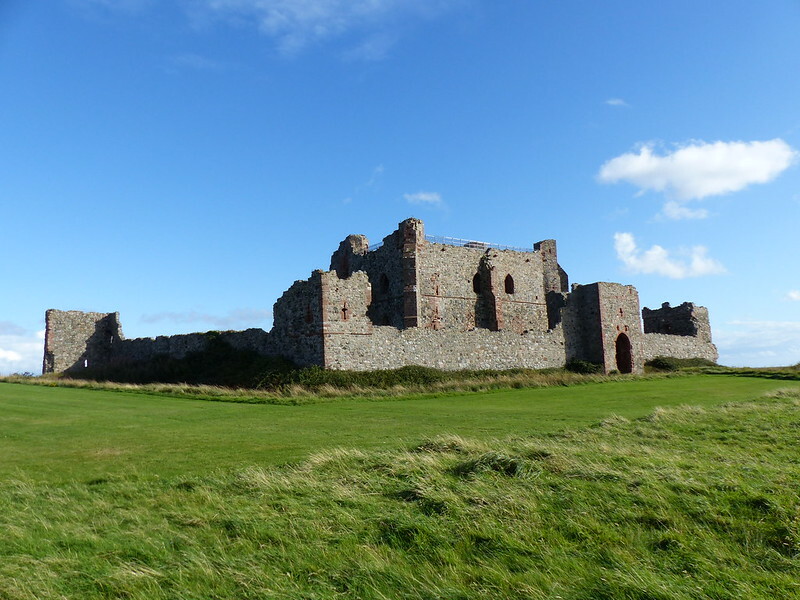 In fact , the principal impression I took away is that surprisingly little is known about the castle, because it so infrequently appears in written records. Regular readers will know that I love a good ruin. Tight winding staircases, a dingy dungeon, or lofty battlements all enhance the romance and I was hoping that we might have special permission to access the battlements, but sadly we didn’t. Maybe next September? 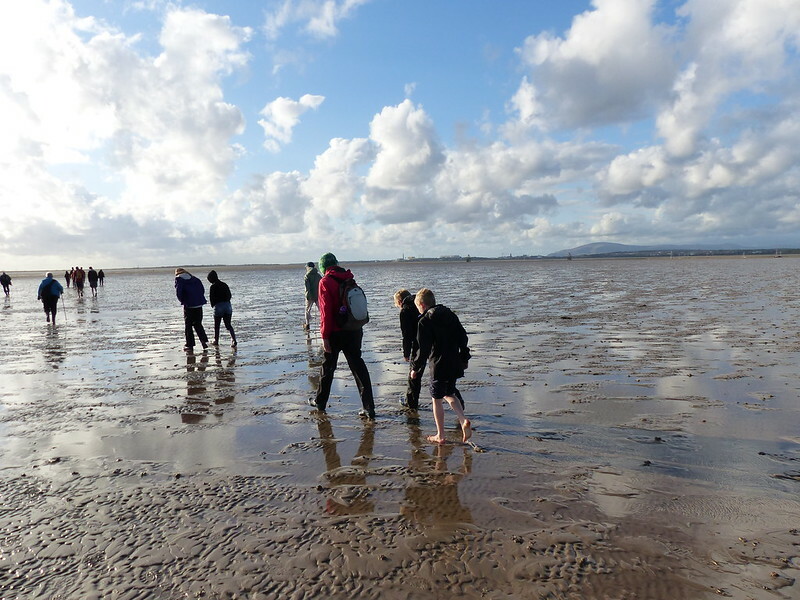 All in all, stunning day out, which was rounded off with an unscheduled fish and chip supper in Ulverston, where, unbeknownst to us – at least before we arrived to find roads closed and streets thronged with people – the Lantern Festival was in full-swing – all very spectacular (I didn’t take any photos sadly). John Murphy is a former mayor of Barrow, and seemed to have inexhaustible funds of jokes, anecdotes, nature lore, local history, patience and good humour. 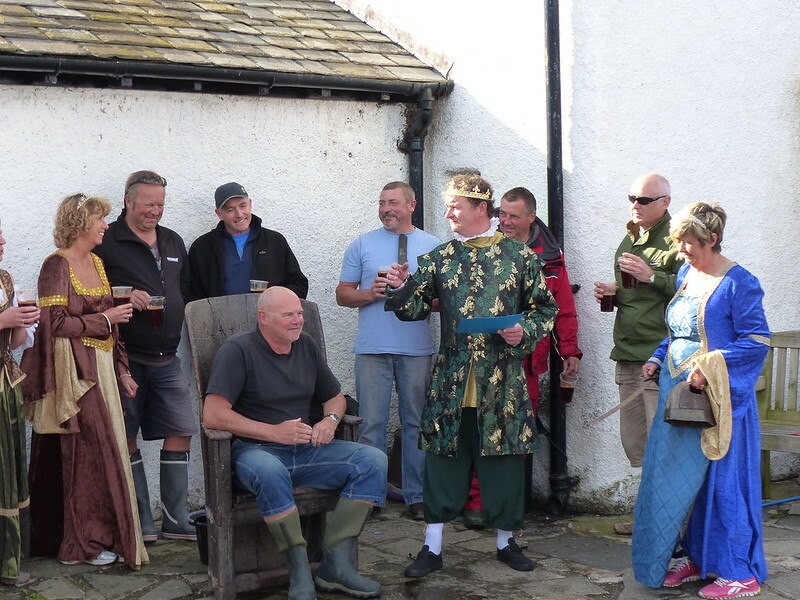 I gathered that he regularly runs guided walks in and around Walney, and would have liked to include a link, but I can’t find anything on the internet which doesn’t relate to walks which have already happened. Probably worth googling next summer if you are interested. Laurence Sterne, in The Life and Opinions of Tristram Shandy, Gentleman, conveys his narrator’s grief following the death of the clergyman Yorick with an entirely black page. It’s tempting today to post something similar, to reflect my black mood after last night’s calamity. 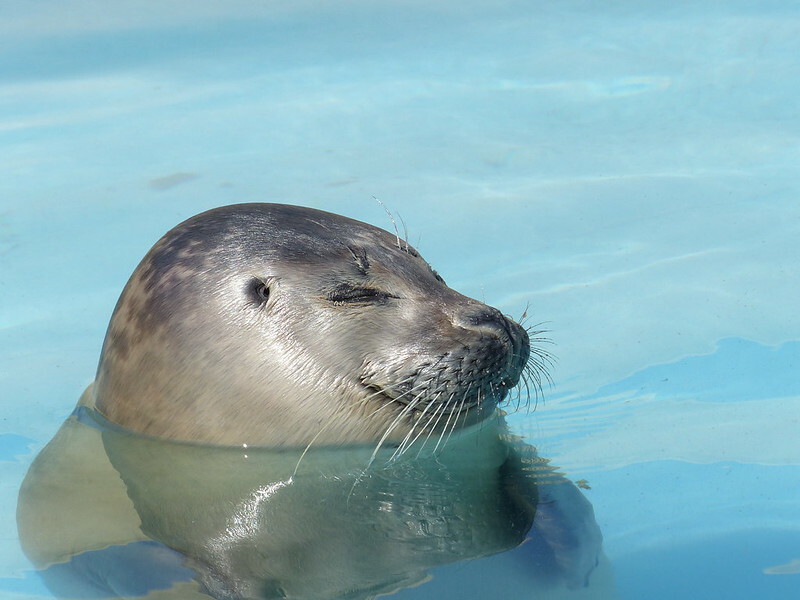 Instead, I shall take a deep breath and attempt to attain the inner peace seemingly enjoyed by this seal pup, one of several that we saw at the Skegness Seal Sanctuary. The other raffle prize my parents came away with, not from their bowling club, as I erroneously reported yesterday, but from a patient’s association raffle at their local surgery – even better! – I can see the headlines now in the Daily Hate: “Pensioner’s Prescribed Horse-Riding on NHS”, what with the hacks at the Hate Mail not letting the truth stand in the way of propaganda, anyway, the other raffle prize my parents won, was a family ticket to said sanctuary. 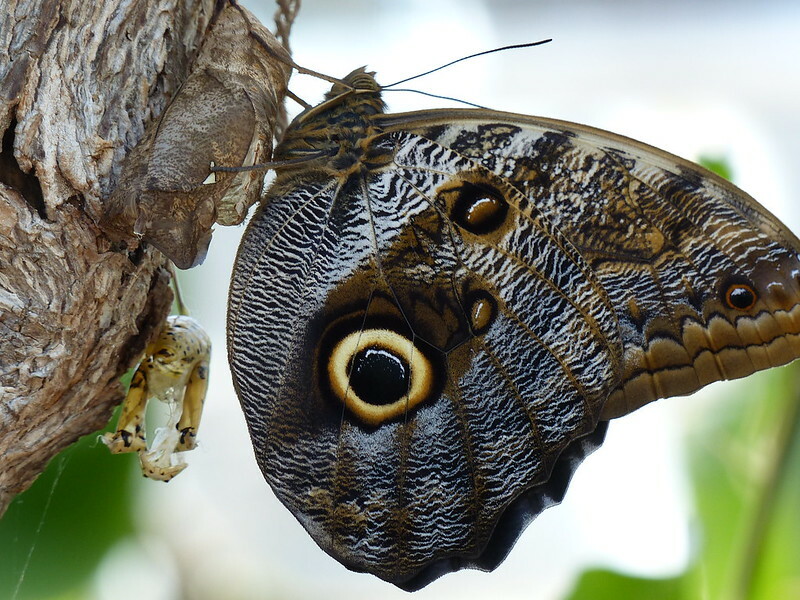 This one had just emerged from its chrysalis…..
I’ve been at this blogging malarkey for quite some time now, and though I get frustrated sometimes when it seems that I’ll never catch up with myself, I must enjoy it, or I wouldn’t still be at it, six and a half years and six hundred and seventy posts down the line. I’ve written before about the benefits of keeping a record and of being aware that you intend to do so. Then there’s the Social Media side of things, although I’m only too aware that I often fall down badly on that front. There have been a few freebies along the way too – bits of gear, a few books and, most notably, a trip to Jersey. 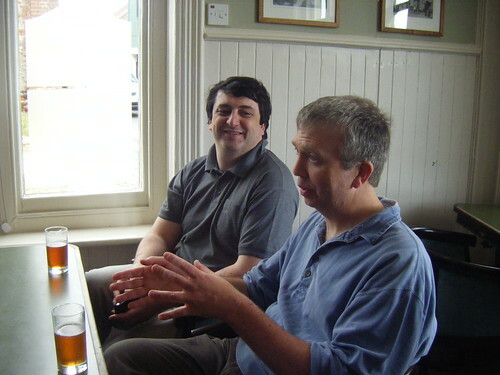 But here’s a new and totally unexpected development: an old school friend tracked me down via this blog and invited me to a reunion of our A-level maths class. 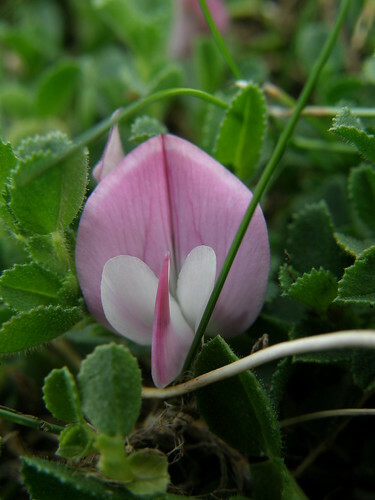 A mallow. 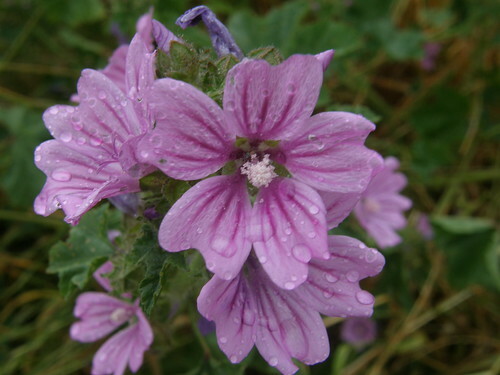 Common mallow, possibly. 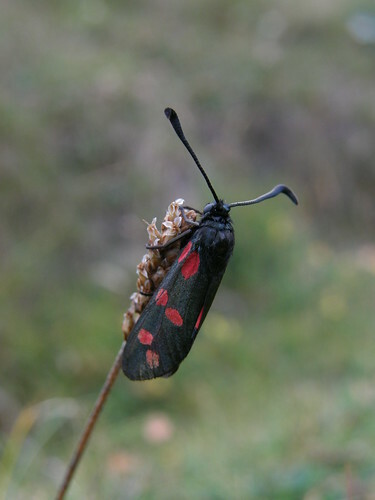 The weekend get-together took place in Norwich at the beginning of July. Norwich is a bit of a long way from just about anywhere, but it’s a particularly long way from Silverdale. 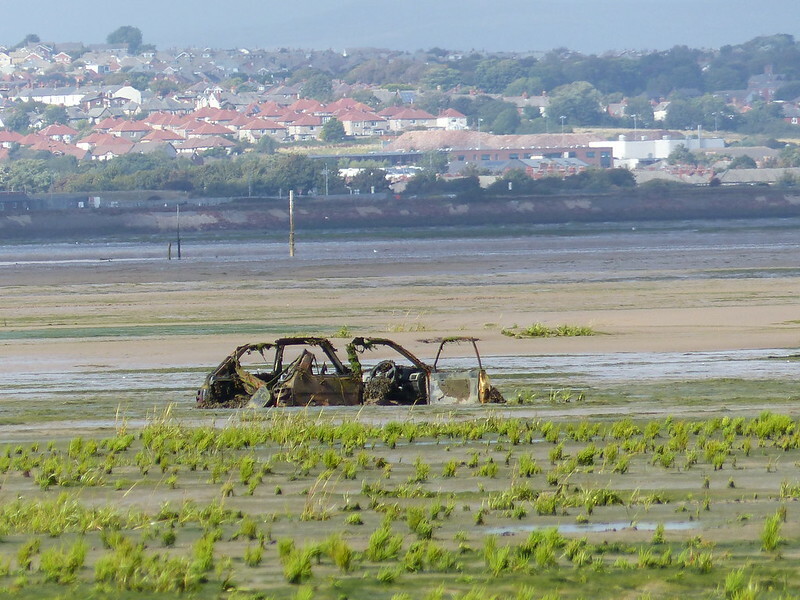 Having abandoned my original, deranged plan of driving down on the Friday evening (it’s a good job I did, the M62 was shut at Junction 25 and I spent an hour or two queuing through Huddersfield), I arranged to meet the others on the coast on the Saturday Morning. 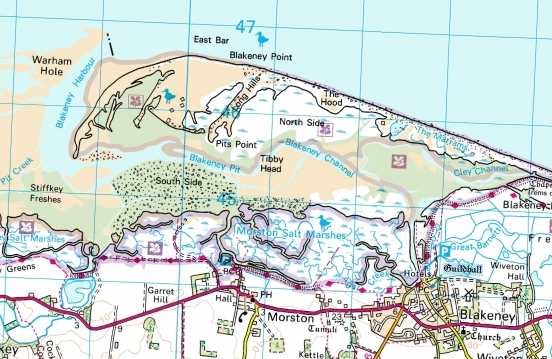 I’d left my half-way stopover in Blyth, just off the A1, very early, and arrived with some time to spare and so had a little wander along the North Norfolk Coast Path. Very nice it was too, despite the grim weather. I’ve subsequently done a bit of lazy internet research and I have to say, this looks like a very attractive path. 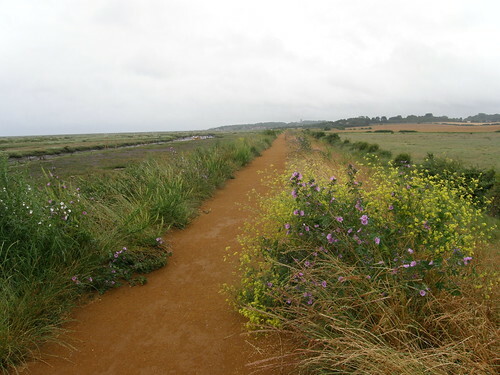 This section, at Morston, was resplendent with unfamiliar flowers. 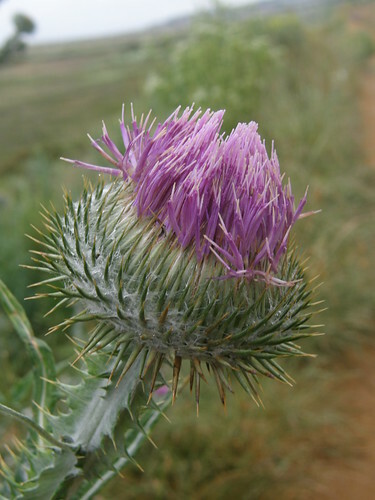 I think that this (and the photo above) is woolly thistle. The others arrived in plenty of time for the boat trip we’d booked. 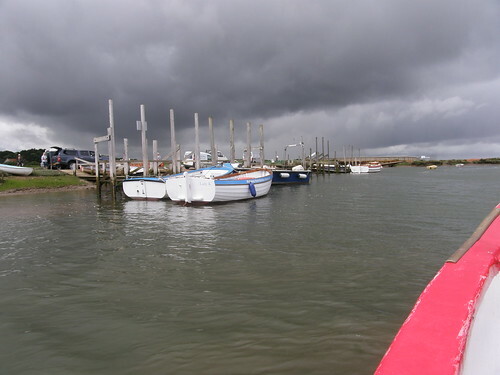 Boats go out from Morston Creek and round to Blakeney Point. 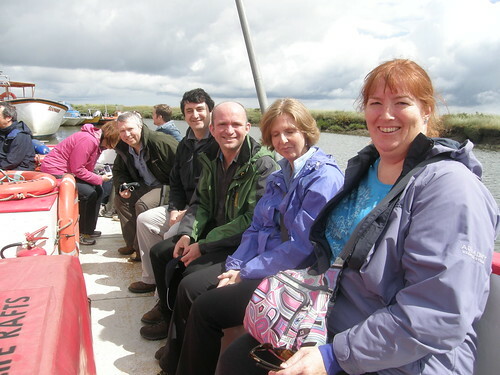 Here we are on the boat….. 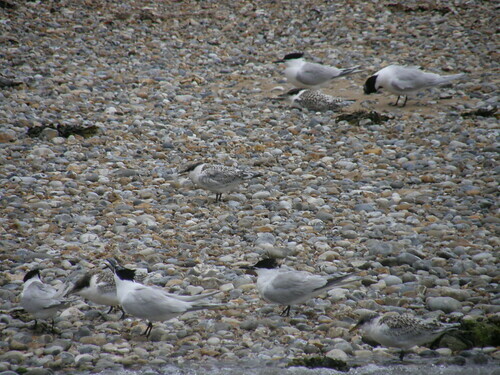 The beaches, and the skies above them, were busy with terns. 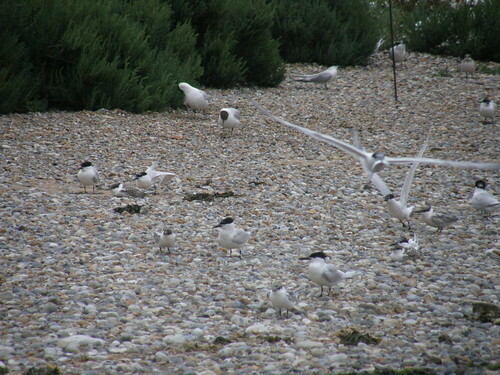 These are sandwich terns, and juveniles (note the black beaks and legs and the tufted hairdos). And again. All of the photos were taken from a moving boat, which didn’t help with the quality. That’s my excuse anyway. The out-of-focus bird in the air had a fish in its beak. 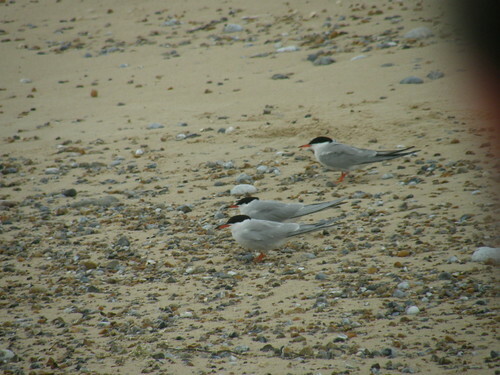 I think that these are common terns, with yellow beaks and legs. 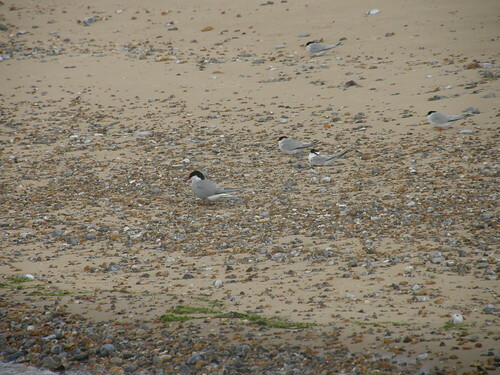 The two smaller birds here are little terns. You can’t see it without zooming in, but the little tern has a distinguishing black eye-stripe which is the telling detail. 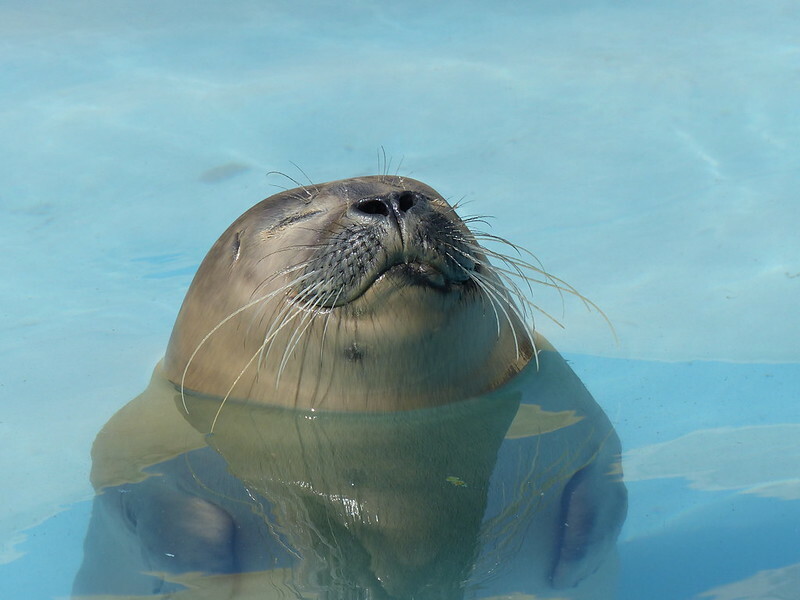 The other highlight was the seals. 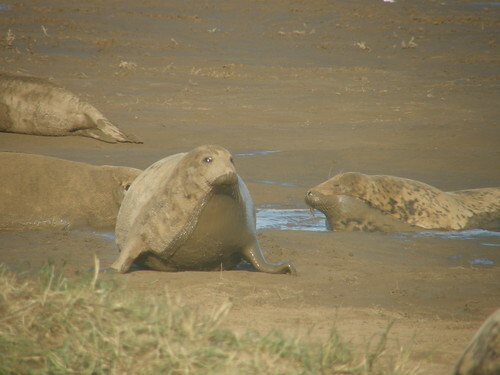 Common seals pup in the summer, so the opinion offered was that the seals on the beach were common seals, and the seals in the water would be grey seals, which give birth in the winter. I’m not sure it was that simple however. And, whilst it’s meant to be easy to tell the difference, I’m not confident, so I shan’t venture an opinion. 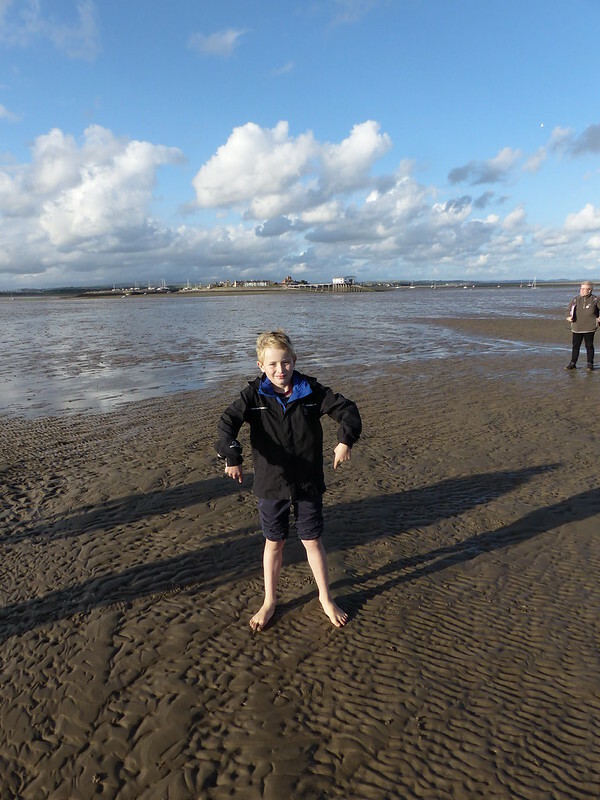 We had a bit of a walk on the spit of land which forms the point, visiting the old coastguard station…. There were also a couple of old lifeboats moored in the channel. 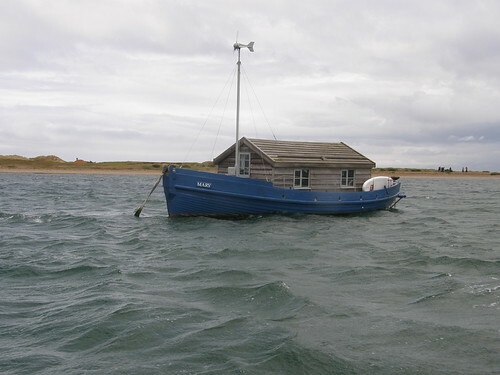 I was intrigued by the fact that they apparently had a wooden shed constructed on the deck. Not sure if that’s part of the original design or a more recent attempt to emulate the Skylark. 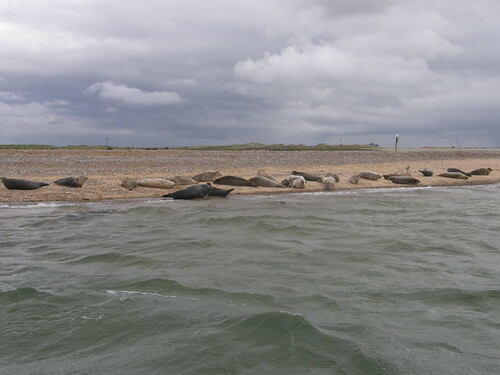 After the excellent boat trip we drove a little down the coast to Cley. 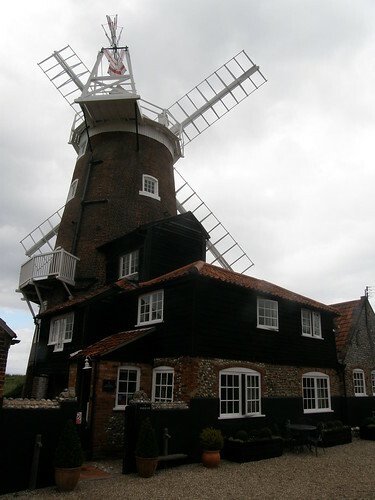 Unfortunately, the windmill was closed. Fortunately, the pub wasn’t. Long-suffering readers will now that I’m quite partial to a stained-glass window. 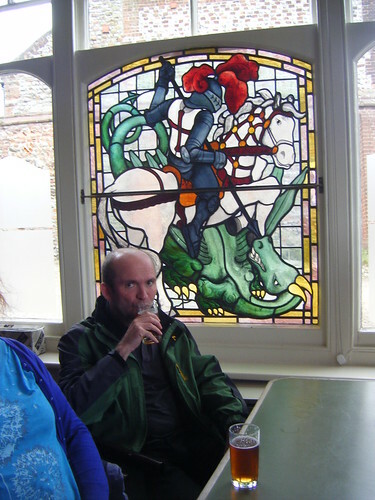 Especially if it depicts St. George dispensing with the poor old dragon. Not sure why D is looking so guilty and/or furtive about his beer. I shan’t attempt to summarise the remainder of the weekend, except to say that it was thoroughly enjoyable. 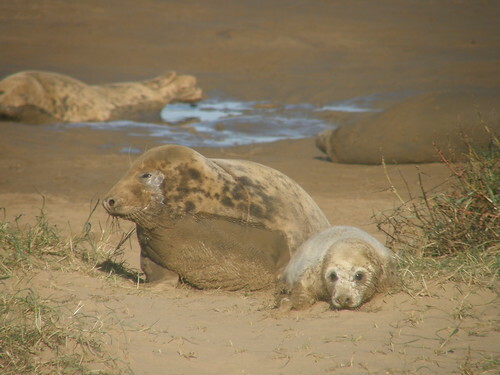 Two years ago during an October half-term visit to my parents, we went to Donna Nook on the Lincolnshire coast to see the Grey Seal colony there. 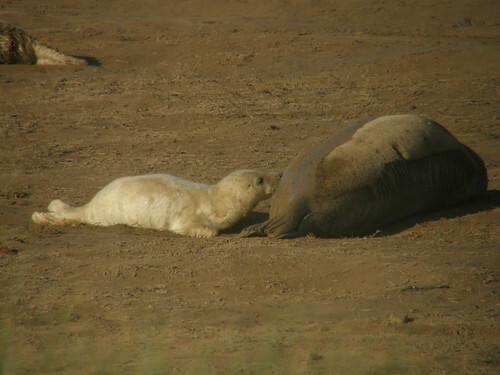 It was early in the season and there were relatively few seals there and only one new-born pup. 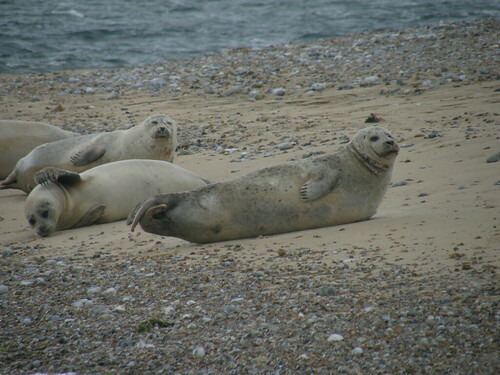 This year we were visiting on the first weekend in November and though the beach was not yet at it’s busiest, there were many more seals and lots of pups. On this side of the Atlantic the pups are born in the autumn. The gestation period must be close to a year, because the bulls are here not to assist with rearing the young, but in order to mate with the cows. 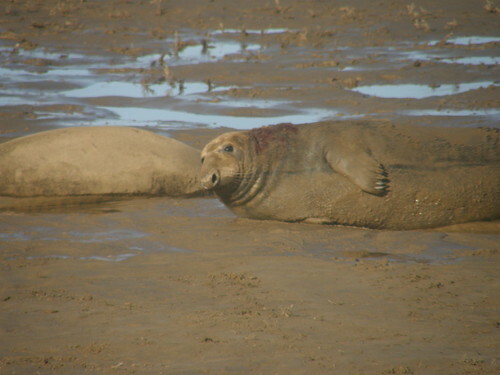 The bulls are huge (up to 3.3m and 310 kg apparently) and often have scarring around their necks. Presumably from injuries picked up at this time of year during sparring with rival bulls. ..is lifting herself up to shuffle forward. This cow and her pup…. 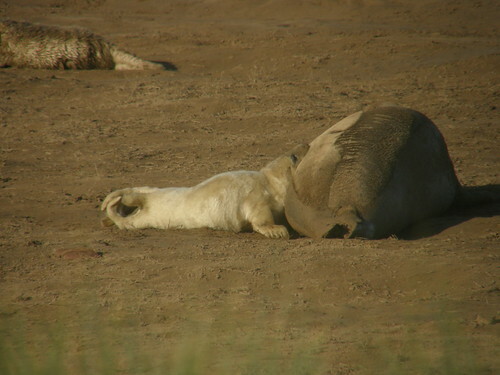 …climbed up into the dunes towards us. 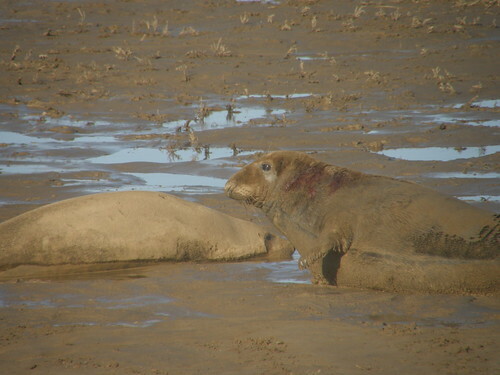 We could see afterbirth in several places on the beach which seemed to have drawn in numerous black-backed gulls. 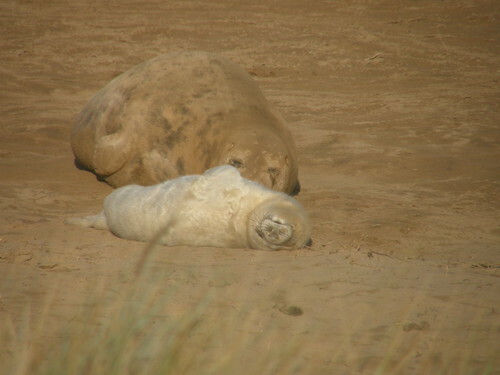 I suspect if we’d stayed long enough we may well have seen a pup being born and I would have happily stayed for several hours, but there was a very bitter wind blowing off the sea and the kids had enjoyed seeing the seals but now wanted to be away to Cleethorpes for some fish and chips. 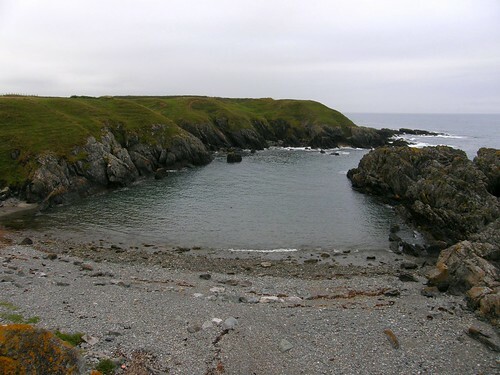 One morning I cycled down to the natural harbour of Porth Ysgaden and walked along the coast to Porth Gwylan, another, larger, natural harbour. 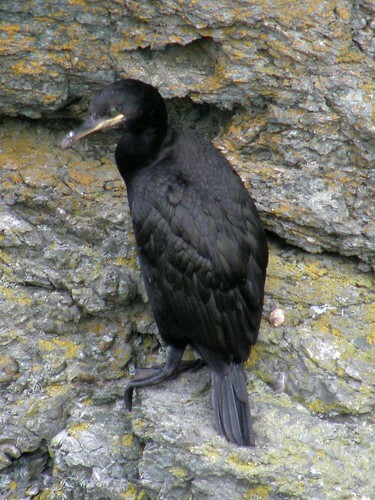 Between the two, this rocky inlet, unnamed on the OS map, was home to many cormorants with two obvious, large and untidy nests and birds dotted about the cliffs. 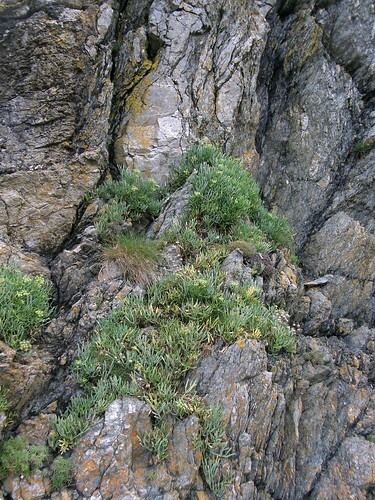 You can perhaps see a small speck in the water almost in the centre of the photo. 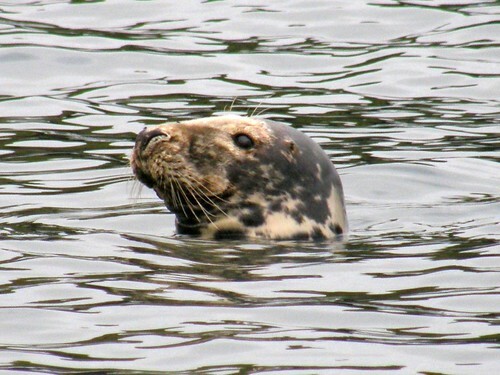 It’s a grey seal. 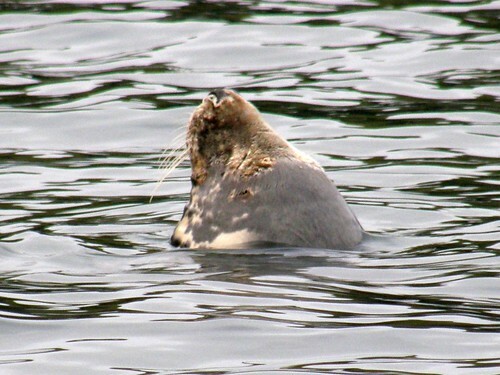 Sometimes one or two other seals would surface for a while, but this one stayed almost stationary, snout pointing upwards, apparently asleep. 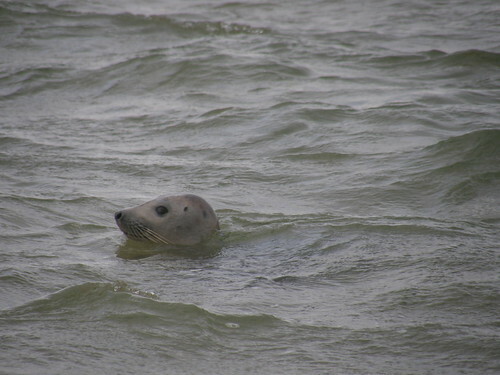 I went down to the shingle beach to get a closer view. 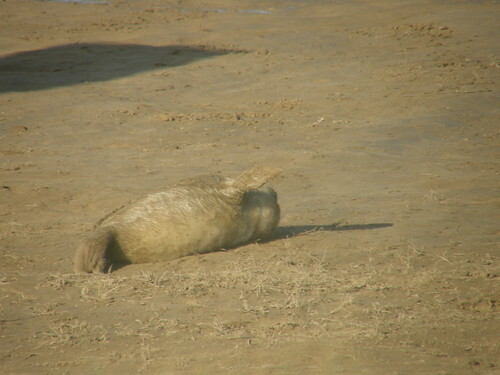 And even momentarily attracted the attention of the sleepy seal. But not for long. 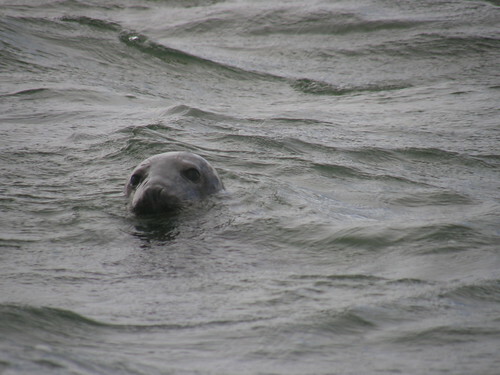 I watched the seal for quite some time before heading back to the campsite. 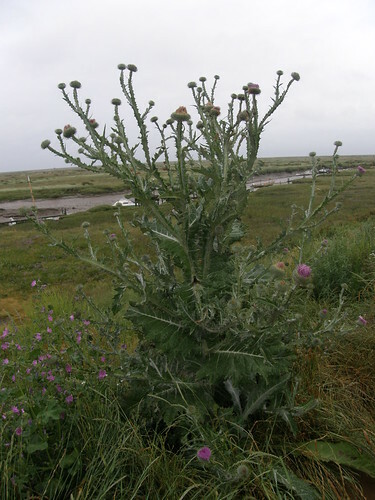 “This is rock samphire isn’t it?” TBH asked. 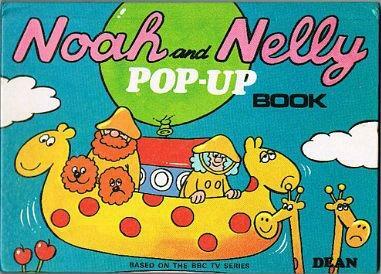 So I did, reluctantly. 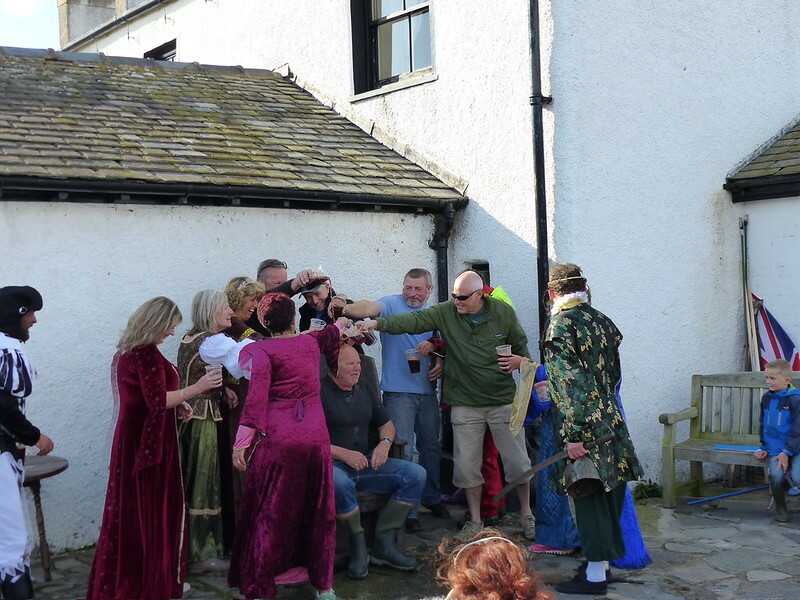 It was foul – tasted like soap. “It’s foul – my bit tastes like soap!” I said, between all the spitting and retching. 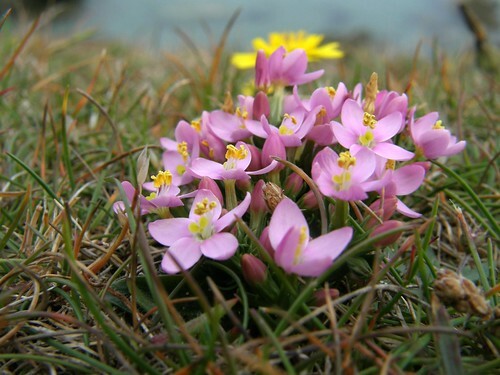 I’m pretty certain that it’s centaury, but I’m not sure which one. 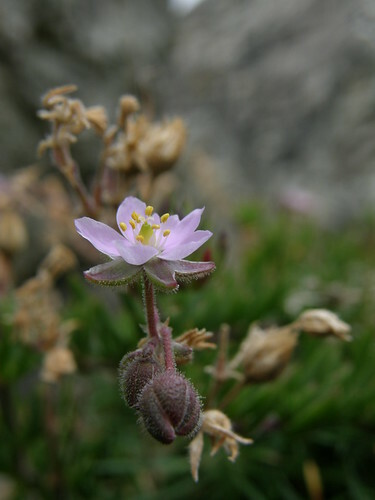 I think that this is a centaury again, growing much taller on the rocks where the sheep can’t get to crop it short. 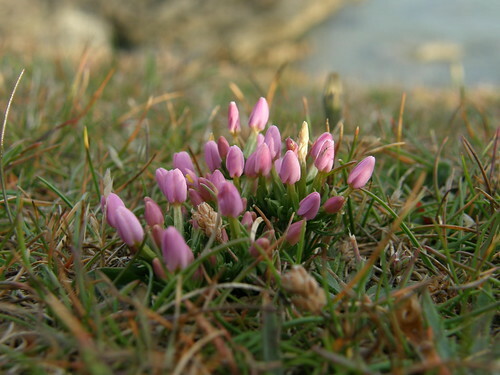 Judging by the rosette of narrow basal leaves it would say that it is seaside centaury, which I suppose makes sense.